Friendship more than wine brought me out to Prince Edward County this Wassail. The news of Richard Karlo’s death last week on November 26 had stunned me and I needed to be with other people who were also saddened by his passing. Saturday was a raw cold day like the one in 2010 for my first Wassail. That year I’d come as a stranger, this year I came as a friend. My first stop was at Broken Stone, I’ve written up Micheline and Tim Kuepfer twice before in my blogs. We must have been one of their earliest visitors when they opened in 2012 and I had called their 2010 Pinot Noir an amazing buy for a first release. When we visited today Tim was all smiles. They were sold out of just about every thing in stock with just a few cases of the 2013 Pinot Noir left so they’d experimented with a Pinot Frais, sort of like a Beaujolais Nouveau but with a totally different grape. It worked really well. So we picked up one of each. 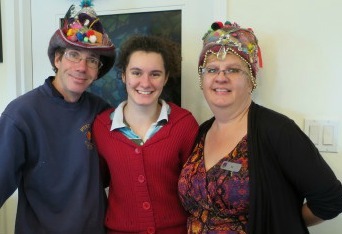 Kimball, Emily and Liz Lacey with their Wassail Crowns. Next stop Lacey Estates, just down the road. Liz is my “go to” person for County news. She was wearing an extremely glamourous hat reminding all who entered that she and her husband, winemaker Kimball Lacey, had been named King and Queen of Wassail. Although Kimball makes great wines, I think Liz’s fantastic gourmet delights pushed them over the top in the selection criteria. She currently has a wonderful apple, pear and raisin chutney on sale for Christmas and it pairs well with their Gewurztraminer. I think Kimball makes the best Gewurtz in the County. He had to be dragged in from the backroom, where he and his daughter Emily were labeling bottles, in order to take a photo with their Wassail crowns. Emily is planning to go to Niagara College to study winemaking as well. She has made her first Pinot Gris, one which stayed on its lees throughout fermentation so it’s a glorious pink. They poured me a sample, it’s still very young and a little sulphurous but there’s great potential there for the future. Where ever we went the conversation was about Richard’s unexpected death. He was a brilliant eclectic winemaker and his winery Karlo Estates in its beautiful old 1850s barn has been the first place I’d take summer visitors. He and his wife Sherry were the warmest friendliest hosts possible who made every visit exceptional On their wedding day in June, he reportedly suffered a back injury moving a skid in the morning. By the end of the week he was in hospital unable to move. He had been incapacitated ever since. Everyone thought it would be a long but eventual recovery but Richard never revealed that he also had colon cancer and was terminally ill. His death on Nov. 26 came as a total shock to everyone but their closest friends. The last time I was there in the spring, he gave me a big hug, I now realize that it was a good bye and not a greeting. We stopped in at Karlo Estates and would not have been surprised to see the place draped in black with Richard’s picture prominently placed, instead their tasting room was filled with noisy Wassaillers having a great time. I don’t think anyone even knew that he had died. I’m sure somewhere Richard was happy that his legacy was living on. We went into their tiny winter tasting room to buy our wine. It had at one time been the calving pen. When I first visited three years ago, it had been very rough but now it was completely finished. 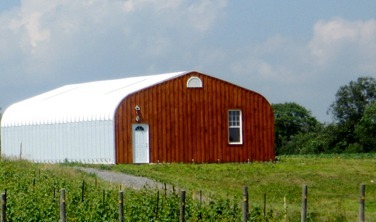 Every square inch of the winery radiates the love and the fun this winery couple had shared in their life together there. I bought two bottles of the Van Alstine white port. I wonder if the wines of deceased winemakers have the same cache as paintings of dead artists. This will be the last vintage touched by Richard’s hands. To me, it is priceless. We took a chance and visited the reasonably new Hubbs Creek Vineyard across the road. It has always been closed when I’ve stopped by before and this time was barely open as John Battista Calvieri, the winemaker, was busily cleaning a tank with a friend from Hinterland Estates. Up to now Long Dog has been my favourite place for really great Pinot Noir but I think Hubb’s Creek may join the short list His Pinot had a really rich taste of ripe raspberries and lighter notes of strawberry. Once I introduced myself, John Battista let me try some of the whites still in the tank. The young unoaked Chardonnay was cloudy and still foaming but had lovely flavours. Then he gave me a tasting straight from the barrel of his oaked chardonnay which was far more stable. It had strong pink grapefruit notes and is still fermenting,but it will be a very full-flavoured Pinot Gris when it’s released next summer. Chardonnays from Niagara grapes were eminently drinkable and reasonably priced but the County Riesling was wonderful. Lemon, lime and peaches predominate. Their Hillier Blanc was the most expensive at $28.00 a bottle but as a blanc de noir it is delightfully unique. Made from the white juice of Pinot Meunier having virtually no contact with the skins in fermentation and blended for a fuller flavour with Chardonnay. Very lovely unique wine. I was also in Keint-He for an update on a fellow Nova Scotian who is now their Associate Winemaker. I first met Travis McFarlane as the viticulturalist working with the sparkling wine expert Bruce Evert at L’Acadie Vineyard. the following year he had moved on to Blomidon Estates to work with one of Nova Scotia’s most notable winemaker Simon Rafuse. 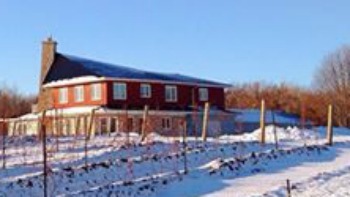 Then he had become the viticulturist and winemaker at Planters Ridge, a new Nova Scotia winery. He was there long enough to bring out his first wine releases including a Tidal Bay that won accolades. Then he turned up in Prince Edward County. His newborn son needed a liver transplant and he and his wife Stephanie had moved here to be close to Toronto Sick Kids Hospital. Finlay is now recovering from his transplant, a small section of his mother’s liver, it is still touch and go but there is hope. Bryan Rogers at Keint-He is a hero for helping this young family transition through this difficult time. Last stop Hillier Creek, which was packed with Wassaillers from Trenton. I grabbed a couple of bottles of their Gamay Nouveau, which was reminiscent of the Lauren Horlock’s great Gamay Nouveau from 2010. No time to talk to anyone they were bursting at the seams. Why would anyone who lives in this area bother to go to the LCBO? Every bottle of wine in my cellar has a story. Where do the wine flavours come from? Wednesday, Dec. 3rd. 1 – 3 p.m. and 6 to 8 p.m.
Thursday, Dec. 4th 5:00 p.m.
Thursday, Dec. 4th 6:30 – 9:00 p.m.
Where is PEC in Vintages Essentials? Veronica, your stories about the wine are wonderful–even for a non-drinker. I’m sure Richard will be missed, but he will be toasted as well, as friends do.